How Our Small Engine Repair Charlotte NC Services Your Equipment Fast! We’re in the business of small engine repair Charlotte NC; and we always work hard to ensure that your equipment whether it is under warranty or not will be serviced in a timely manner. Power equipment breaks down for many reasons, so it is very crucial for you to keep our service center in mind whenever you are looking for a great repair service! Chainsaws – Have a Chainsaw that won’t start? We will be more than happy to take a look. 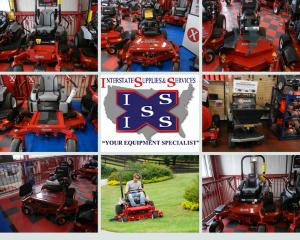 Mowers – Nearly all major brands of lawnmowers are serviced by us at Intesrstate Supplies & Services. Blowers – We perform repairs on nearly all blowers, and we stand behind our work. Trimmers – We fix trimmers faster than anyone else! Pressure Washers – If your pressure washer isn’t running well, then bring it by and we’ll get it fixed. Our small engine repair Charlotte NC service is a dedicated service center which covers any and all of your service needs. That is the reason why we started: we wanted to ensure our customers’ lawn care equipment needs. Our customers trust our expertise because we’ve been servicing mowers onlne for quite some time. Once we were able to successfully meet this challenge, the next step was for us to expand to multiple other areas. We even carry our own line of power equipment and mower parts Charlotte NC. Our parts warehouse is fully stocked with the parts from nearly all major lawn mower brands. 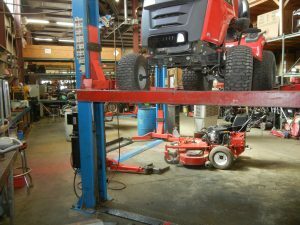 Our service department uses our parts when we service mowers, and nearly all of our customers trust that we have an eye for quality. One thing we’ll always keep in mind: your business is our business. This means that we always will take care to ensure a fast and reliable turnaround time. We are also more than willing to stand behind our work to ensure a great outcome. Author David EcksmithPosted on August 17, 2017 May 19, 2018 Tags charlotte nc small engine repair, charlotte small engine, fix small engine charlotte, small engine repair, small engine repair charlotte nc, small engine repair matthews nc, small engine repair union county nc23 Comments on How Our Small Engine Repair Charlotte NC Services Your Equipment Fast! Given the benefits of aerating your lawn, you’re probably wondering when to aerate your lawn in NC so you’ll get the biggest benefit for your efforts. You definitely don’t want to forget to aerate, however! Over time, your soil becomes compacted – meaning it more closely begins to resemble clay. Aerating your lawn pokes small holes into it so that nutrients, air, and water are allowed to enter the soil. Aerating contributes to a more beautiful, lush, and fuller lawn. Otherwise, you could end up with nothing but dead grass during the growing season. The Main Question – When to aerate your lawn in NC? The time of year to Aerate your lawn depends on the type of grass that you have. Many people in NC aerate during the early fall, because they have yards with cool-season grass such as Kentucky Bluegrass or Fescue. If you have warm-season grass such as Bermuda Grass, it’s best to wait until the Spring. If you choose to aerate during the spring, it’s best to wait until you’ve mowed so that your grass will be able to recover from the disturbance aerating can cause. 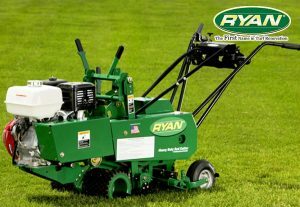 We have a large selection of both Classen and Ryan Aerators. These aerators are designed to power through large chunks of turf. You might have a preference for a specific type of aerator such as a stand on aerator, but you’ve got plenty of choices at Interstate Supplies & Services. Not aerating at the right time means that you’ll miss your window. If you don’t aerate, that could mean a brown yard during the year. If you’re a landscape professional, you will definitely want to have an aerator on hand so you can offer the service to your customers. There are very big benefits that your customers could be missing out on if they forget to aerate! If you are looking for a Echo Trimmer Matthews NC, then you will not be disappointed with either the SRM-225 or the SRM-2620. Both of these trimmers have plenty of great features which allow you to get the job done without breaking your back. Both of these Echo options are straight-shaft trimmers and are designed for performance. This is the perfect Echo Trimmer for homeowners. This one offers a professional grade engine and a reduced effort starting system. Furthermore, it also has a 59″ straight shaft and a speed feed head. The speed feed head ensures your work won’t be interrupted. This trimmer features a 25.4 CC 2-stroke engine made from magnesium. The air filter has also been designed to ensure that you won’t have to spend as much time cleaning this trimmer as you would with another. It starts up easily as well, meaning that this trimmer is adapted to some very intense climates. When shopping for a new trimmer, think of all the features which you might need. Do you value power, or do you want something that is lightweight? These are all very important factors to keep in mind when you are looking for your next trimmer. Winter is right around the corner, and fortunately for us it’s fairly mild. There is still an occasional snowfall, so it’s still a great idea to have a chainsaw that runs properly. Cutting Your Own Firewood – Chainsaws let you power through logs! Cutting down a tree or trimming your tree! Cleaning up after a winter storm – What would you do if after an ice storm, you had a tree on your driveway? The most practical need for a chainsaw is after a disaster, whether that is a hurricane or winter storm. We are definitely prone to some of the bigger weather events, so that is why we are here to help ensure that you have the right chainsaw for your needs. 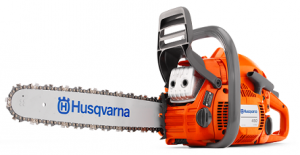 Husqvarna 450 – This chainsaw is an amazing piece of equipment! It’s a great one because it is designed to consume less fuel and is very lightweight at 10.8 lbs. The bar only extends to 20″, but the reason for this is the chainsaw is designed around the needs of homeowners. 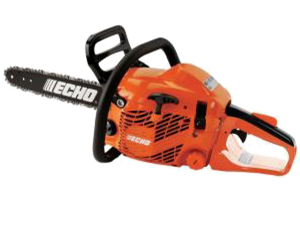 Echo CS-310 – This chainsaw is very easy to start with it’s primer bulb start. It’s got a 2 stroke vortex engine designed to create as much power as possible for you. Air filter maintenance has also been designed to reduce the amount of effort required to clean. It even has a stop switch on the back for safety. Stihl MS-170 – Another lightweight chainsaw, this one has a clutch on the back. The chainsaw also automatically oils itself (even adjusts to cutting systems). It holds a whopping 13.9 fluid oz of fuel, allowing for longer operation time. Finally, the chainsaw is known for a digital ignition system making it easier to start. Don’t be stranded without a Chainsaw this Winter season. Please come by Interstate Supplies & Services at 511 Union West Blvd Stallings, NC 28104 or call 704-893-2878 today. We have the friendliest and most knowledgeable staff in town. This 450 Rancher Chainsaw is durable and versatile. A great asset assuming that this chainsaw has been properly maintained! With hurricane and storm season right around the corner in NC, you’ll probably want to make sure that you have a maintained chainsaw on hand. There’s nothing worse than a chainsaw which won’t start up when you need it. Here are a few basic maintenance tasks to keep in mind to make sure that your chainsaw is properly maintained. Of course, you’ll want to have the appropriate Chainsaw Repairs Matthews NC done if your chainsaw were to break for any reason. Is Your Chainsaw’s Chain Sharp? Obviously, your chainsaw’s chain can wear down over time. A worn out chain cannot cut down a tree, so it is important to remember that you get your chain sharpened. The way to sharpen a chainsaw’s chain is to file it with a file set. Once the chainsaw’s chain begins to crack, then that is when it might be time to consider a replacement. The chain also needs to be tensioned to ensure that it is securely positioned on the bar. Your chainsaw’s chain also needs to be lubricated on a regular basis. The reason for this is that lubricating a chain can cause premature wear, so you should refill the chain oil each time you refuel your chainsaw. Also included is making sure that your chainsaw’s bar is also clean. Don’t forget that your chainsaw has an engine. This is another part of the chainsaw which will require regular repairs and service to prevent problems from arising. Remember to clean the fuel filter, the oil tank, and the carburetor; The clutch break and clutch drum can also easily wear out as well – meaning that these are components of the chainsaw which should be inspected carefully. 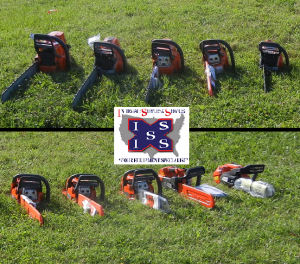 At Interstate Supplies & Services, we have a team of professionals as well as many tools which are needed to keep your chainsaw in good working order. If you’re in the tree business, then you can’t afford a non-working chainsaw which is why we are here to ensure that your chainsaw won’t go out of order. Features 21″ Deck – gas push mower. Powerful engine, rear wheel drive. 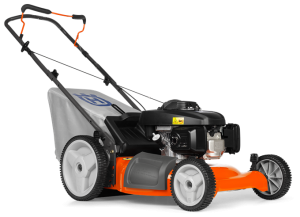 Husqvarna is a mower brand which is geared toward saving your back with its self-propelled system. 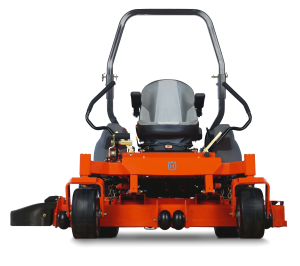 The company’s push mowers have a adjustable deck height which is designed to be adjusted to 3 positions for maximum comfort. Because it is able to move to 3 positions, it is capable of being able to maneuver around sharp turns. The reason for the maneuverability is due to the mower’s compact design. With the compact design, Husqvarna push mowers are easy to push around shrubs and other garden features. These mowers have also been designed to navigate uneven terrain. Uneven terrain can make things slightly difficult for the operator, so this Husqvarna mower has a few built in features which are designed to help navigate past some of these challenges which the uneven terrain can pose. Deck heights are also easily adjusted in a Husqvarna mower (1.25″ to 4″). These deck heights can make it easier for the operator to obtain the cut they are looking for. If you’re worried about corrosion, the powder-coated cutting deck has been designed specifically to resist some of the rust that can occur. In all, Husqvarna push mowers are designed for tough work. Because they are self-propelled, it’s very easy to operate a Husqvarna push mower. They move on their own power, which saves you the effort of pushing a heavy lawn mower around. These mowers also feature an ergonomic design which makes these mowers easy to maneuver. Our Lineup of Husqvarna chainsaws that we’re proud to display. Husqvarna is one of the newer additions to the collection at Interstate Supplies and Services. Husqvarna has a large collection of products, and one area which the company is known for is chainsaws. They have 3 different categories of use: full time, part time, and occasional use. These chainsaws are for the professionals, and they feature a longer arm. They are very powerful, ranging from 2.7 hp to 8.4 hp. The 8.4 hp chainsaw (Husqvarna 3120 XP) is designed for professional use and is among the most powerful in the world. Included in the mix are also electric chainsaws and pole chainsaws. For landowners, landscapers, and others whom are using a chainsaw quite regularly, Part Time chainsaws are the best option. These aren’t quite as powerful as the chainsaws designed for full-time use, but are still very powerful. Many feature a long bar as you might encounter a very demanding job which requires you to be able to put out a lot of torque. If you’re cutting smaller trees or doing other less-demanding tasks, these chainsaws are for you. They’re very lightweight and have approximately 2.0 HP in strength. They are designed for low emissions, but also to be comfortable to operate with a fully ergonomic design. What is most impressive about Husqvarna chainsaws is that the chainsaw bars have been designed for efficiency. They have bars which are laminated for prevention of corrosion. The bar is also designed to be super strong. Whether you are looking for an occasional chainsaw or you’re a professional logger, Husqvarna likely has a chainsaw which is designed to fit your needs. Simplicity Lawn Tractor – Notice The Roller on the Cutting Deck which is for lawn striping. Ever seen a picture of the perfectly-sculpted lawn and been curious as to how it’s done? Simplicity mowers are precision-crafted to create the perfectly sculpted lawn that you’ve seen in the magazines. 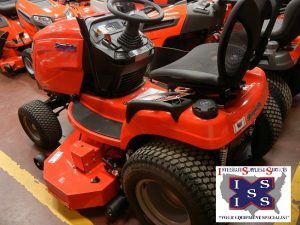 Simplicity Mowers are one of the items which we offer here at Interstate Services and Supplies. These are quite popular since they are designed to create those beautiful golf course quality lawns. How Does The Free-Floating Mower Deck Work? This free-floating deck is the reason why Simplicity mowers are able to create such a beautiful pattern in the lawn. This feature offers the mower the ability to pivot easily around turns. Ultimately, the free-floating mower deck means that the mower deck moves independently of the tractor itself. The benefit of this system is that the mower deck is able to cut a unique pattern into the grass. The Simplicity mower has a built-in roller near the cutting deck. What this means is that the roller pushes the grass in the forward direction if the mower is making a straight pass, and pushes the grass blades in the opposite direction if the mower is traveling in the opposite direction. This pattern of cutting grass means that the Simplicity mower is designed to create the beautiful patterns in the freshly-cut grass which you have likely envied. Watch this video which explains the art of lawn striping by Simplicity Mowers. This is the same method which is used to create some of the beautiful lawns which are famous in baseball stadiums. How Often Do I Maintain My Mower? Commercial lawn mowers are much like our own vehicles. It’s very important to keep up with the maintenance on your mower, otherwise you could end up with a mower which doesn’t work. To find out how often you should perform your basic mower maintenance tasks, the best place to consult is your operator’s manual. As an example, the Husqvarna PZ-54 Mower requires an engine oil change after 50 hours of operation. You should also be checking your engine oil levels on a daily basis to ensure that these levels don’t fall below acceptable amounts. Bearings are another part of the mower which should not be neglected. This is what reduces the friction caused by the normal operation. This takes a little bit longer to be necessary: this is typically performed after every 200-250 hours. In the case of the Husqvarna PZ-54, the bearings to be lubricated include the front wheel mounts/bearings wheel and deck zerks, and the deck spindles. The advice of the manufacturer is to use high quality grease only to ensure that the deck is properly lubricated. The Husqvarna PZ-54 also features a transaxle fluid filter and transaxle fluid. This is to also be changed every 500 hours to ensure that the transaxle fluid is fresh and will last for a longer time. The regular oil filter should be changed every time you change the engine oil on the mower. Changing oil and performing maintenance tasks are two items which are very easy to fall behind on with regard to your maintenance. You don’t want to get caught behind, otherwise you could end up with more mower problems which will keep you off the job. Author David EcksmithPosted on May 30, 2017 May 19, 2018 Tags change mower oil, check mower oil, lawn mower maintenance, mower maintenance12 Comments on How Often Do I Maintain My Mower? Exmark has a patented technology (RED) which is designed to increase efficiency and life expectancy of their mowers. It’s an onboard computer system which features a switch that allows for an optimal setting for efficiency to be used. The RED monitoring system keeps track of the critical onboard systems. These include: temperature of the engine, the electrical system, and oil levels. If anything exceeds a certain threshold, the mower is automatically put into a mode which prevents engine damage and allows the mower to be serviced. Another feature which the PTO/RED system allows for is the automatic engagement or disengagement of the clutch. The idea behind this innovation is to reduce the wear and tear on this critical system to prevent any additional damage in the event of a failure. Even if the throttle is engaged, the clutch is automatically disengaged at 2500 RPM. Mechanical governors have also been replaced with electronic versions, which has increased fuel efficiency since electronic governors are quicker to respond than mechanical versions. The RED system also features a variety of different operational modes for ensuring a optimal cut. With a simple flip of the switch, it is possible to toggle between Max/Efficient/Low modes. The appropriate option to be used depends on the type of grass which is to be cut. Low mode is best suited to wet grass and ensures that the mower is optimally operated. Max mode is for the more challenging conditions. This switch was designed to replace the throttle in order to make the job simpler. Do you like Exmark’s RED technology? Come by our Exmark Dealership in Matthews NC today.